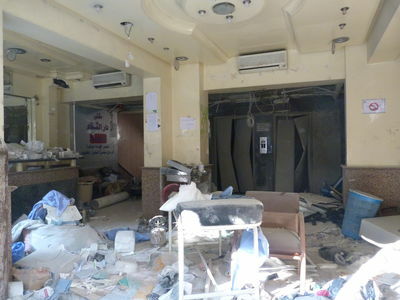 The ground floor of what was for three months the field hospital in Aleppo. 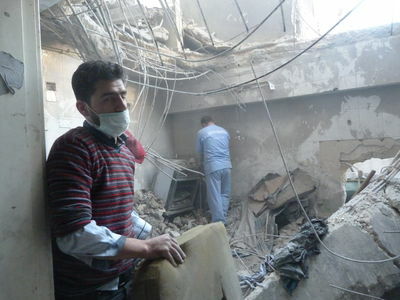 It was completely destroyed by a government airstrike on November 22nd. Between 35 and 40 were killed in the attack, including several medical staff. 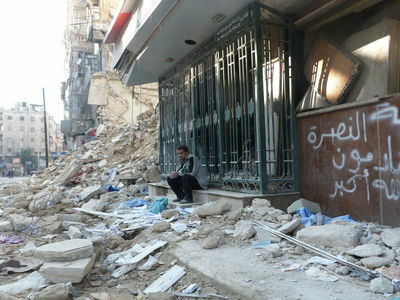 The rebel-controlled part of Aleppo is currently deprived of fully functioning medical facility. A former doctor and a volunteer from the destroyed hospital look through the rubble of what was the main emergency operating room in order to find personal belongings like wallets and identification. When I met him for the first time in late October, Zachariah told me that "Even in the middle of death, happiness can still rise," in reference to his upcoming wedding with Bushra. The two had been married for about two weeks when she was killed. Now, he spends almost everyday alone in the ruins of the hospital, mourning his wife. 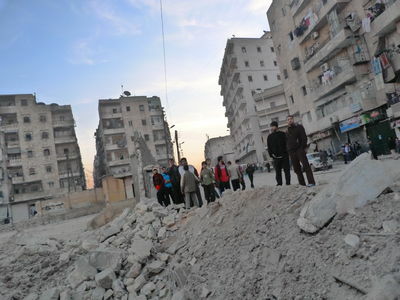 Local residents gather around a crater created by a government airstrike. A syrian aircraft hit a local school twice at 6am on 29/11, dealing great damages to the facility, and disturbing the peace that was slowly coming back to the neighborhood. The school is located three blocks east of the now destroyed Dar al-Shifaa hospital, which was hit by an airstrike that caused more than 35 deaths on 22/11. So far no casualties were reported. 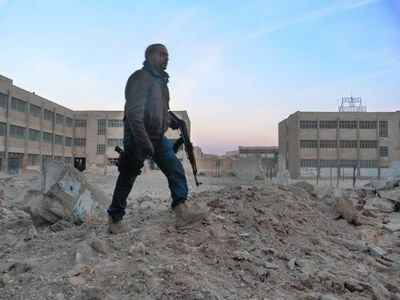 An FSA fighter walks around the crater left by a government airstrike. In the background, a damaged school - the original target. Egypt's Cassation and Appeal courts suspended their work nationwide on Wednesday, November 28, in protest against the constitutional declaration issued recently by President Mohamed Morsi. The decree, issued last Thursday, gave President Morsi powers to take any measures to protect the revolution, and stated that no court could overturn his decisions. The decrees also protect the Constituent Assembly and Egypt's upper house of the parliament, known as the "Shura Council" from dissolution. 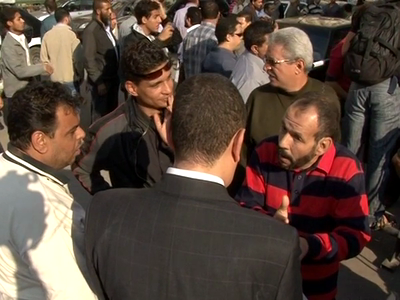 The assembly and the council are mainly dominated by the Muslim Brotherhood and other Islamists. "All lawyers are backing the fair judicial institution of Egypt. We are supporting the decision issued by general assemblies of cassation and appeals courts today, which suspending all their work until the constitutional declaration been cancelled". Earlier on Saturday, Egypt's judge's Club announced suspension of work, condemning the recent decrees issued by Morsi that expand his powers. Morsi's backers say that the decree was needed to protect the gains of the revolution against a judiciary with deep ties to the ousted regime of Hosni Mubarak. Egypt's Supreme Administrative Court (SAC) will look into twelve lawsuits filed against President Morsi's recent constitutional declaration on December 4.